Obsessed with Scrapbooking: Make a Quick Creative Card PLUS Giveaway! Make a Quick Creative Card PLUS Giveaway! 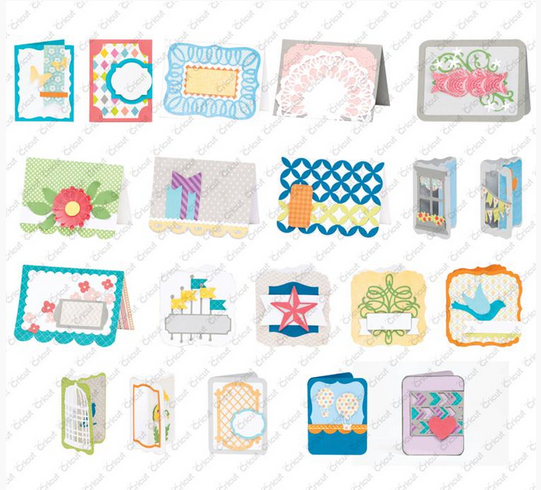 The Cricut Creative Cards cartridge makes 20 different cards with matching envelopes. All layers are all sized perfectly. I cut the card at 5.5", all layers and added another scalloped white section to the inside to write my message. The flower is 3 layers. I'm sorry for the less than perfect photos. I keep trying to take photos when it's sunny out and every time I'm ready, it's raining so I have to improvise. Note to self: Don't use avocado green background ever again...LOL! It's a retro 70s look, that's it! I loved this cartridge so much that I am having a Cricut Creative Cards giveaway, sponsored by Provo Craft. 1) Subscribe to Obsessed with Scrapbooking by clicking HERE. If you have already signed up for my email list shown on the above link, you're good! Winner will be announced next Wednesday, March 6, 2013. Allow 4-6 weeks to receive. Must claim prize within 2 weeks of announcement. What a great all-in-one cart! Your card is great and ya just need one cart. Talk about organized. Joy, you really inspire and get the creative juices flow. Thanks for sharing. Awesome cart, can't wait to see who the lucky winner is! Thanks so much for the chance! Love the bright colors on the card -- it's so cheerful. Thanks for the chance to win this fun cart! Adorable card and great giveaway! What a great cartridge. Would love to win. Thanks for the chance. Thanks for the chance to win this cartridge. I made a few last week in Cricut Craft room and I really, really want this! Wonderful flower card. Thanks for chance to win a great Cricut cartridge. This cart is just what I need. Fast and easy cards. The card is beautiful. Beautiful card. I love this new cartridge. Thanks for the chance to win! What a refreshing spring card. Would love to win this cartridge. I haven't bought a new cartridge in a few years--this would be a fun one! Your card is so pretty I love it and yes I love this cartridge it's amazing I ordered it on Feb 21st and I'll have it any day now. I'm so glad you showcased this cartridge you are the first one to do so. Thanks for doing this You sure brought lots of JOY to my day. and that Provo Craft is partnering with Operation Write Home!!! I'm already signed up for your list. I love the possibilities with this cartridge! Fabulous cartridge, and love that you added another scallopped white piece inside! Fun card... love the colors and that pretty flower! I am already signed up for your email list! Great card! That cartridge is one that I've had my eye on, so my fingers and toes are crossed! Looks like another must have cartridge. Very sweet card. 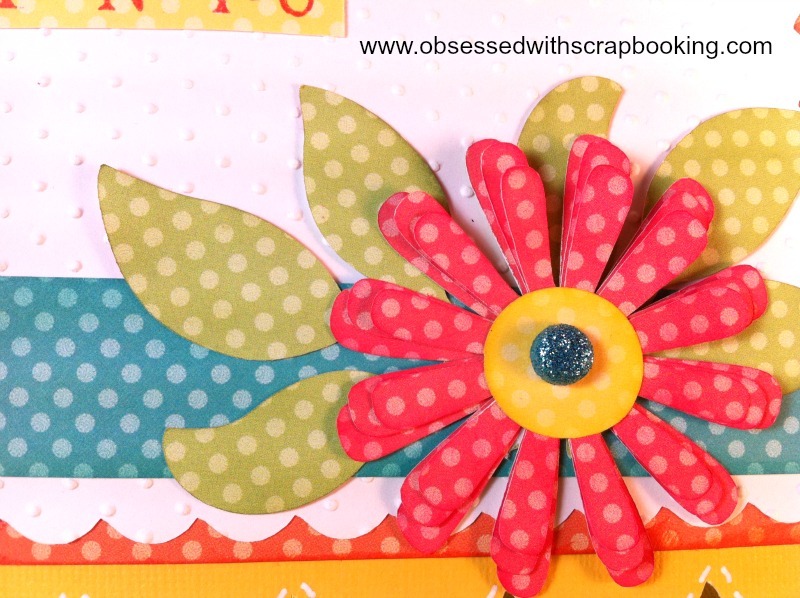 Love your card - awesome layered flower! This cartridge looks really cool! Yes it is AWESOME! Would love to get my hands on that one!!! I get your emails and love your posts. This is the first cartridge in awhile that I really want... thank you for showing it and making such a beautiful "spring-y" card! The papers you picked for this card are perfect. Thanks for a chance to win the new cart. This cartridge looks like lots of fun. Thanks for sharing. I REALLY REALLY want this one., It has been awhile since there has been a good cartridge released. Your card is lovely. Thanks for sharing this and a chance to win. This card really caught my eye! Girl! It was such a JOY to meet you at the Scrapbook EXPO this past weekend! You totally made my day! The Girls at Kiwi Lane Design were just the sweetest and I had the best time. I already subscribe to your blog and this card is absolutely great! I saw this cartridge the other day. Your card is very cute. Thanks for sharing and thanks for a chance to win. Getting your e-mails every day is like sunshine on a rainy day in my mailbox! Thank you for all of your great ideas and all that you share. I LOVE this cartridge. I saw it when it first came out and had lots of questions, which of course you answered in your post today! Thank you for being so wonderful! Cute card, Great cart for fast and easy cards. I love the bright, spring colours on your card! Thanks for showcasing the cartridge too. I haven't seen much of it and have been wondering about it. I make all my own cards and that is a lot considering I have a BIG family and extended family. What with birthdays, anniversarys, get wells, Congrats, graduation, sympathy. That cartridge would be a great help. Please pick me. Oh, forgot thank you cards too. Love this new cartridge. First one I have wanted to purchase in a long time. Really nice card. What a pretty, springy card...TFS!!! Great card, and I would love to win this cartridge. I had started to use it on the CCR when it was Free but less than half of the images showed up on the screen. Then on the last day, suddenly a lot more images showed up. It was late when I saw it and only cut one card and figured they were going to leave the cartridge on CCR for another week now that they had revealed the other images, I was tired and went to bed. Bad move. In the morning the free use of Creative Cards was no longer available on CCR. I had so wanted to try the chevron card.... Thanks for offering it. Wonderful card! Looks like a really fun cartridge! I am already a subscriber so I'm all set! Thanks for sharing! Wow this looks like a great cartridge. Thanks for the chance to win. Well I have to say that I wasnt really impressed with this cartridge....UNTIL I saw your card!! So Spring-y and so pretty!! This cartridge is one I am so excited about! Thanks for the chance to win it. I love your card, thanks for sharing! Your card is lovely. I like the green. Thanks for sharing and giving us a chance to win. love this card, so cheerful and perky! That cartridge has some really fun designs on it. This is a beautiful card and looks like such a fun cartridge! Love this new cart! Thanks for a chane to win! That is a cartridge I would like to own! Great color scheme on your card. Thanks for the chance to win. Cute card! I like the polkadot paper. Thanks for the giveaway! So adorable, love these card cartridges! Hope I win!!!!! Thanks for this great giveaway. This cartridge looks like the perfect solution whenever you need a quick card. Oh! What a cute card. I would love to have that cartridge, thanks for a chance to win. I really do like this cartridge!! Looks like it would make card making very easy! TFS! OMG...I LOVE this new cart! What a cute card - what a wonderful cartridge!! That is certainly going on my wish list. What a great card - I like the added scallop section inside. This looks like an awesome cartridge! I'm already signed up - Thanks for the chance to win! I make a lot of cards and after seeing your example, this cartridge would be awesome to win. Thanks for the giveaway! I am short on time but long on my desire to be creative and this cartridge would sure fit into my life perfectly. Love it! I love the colors! Considering the cold nastiness outside, those were just the colors I needed! Thanks for the fabulous giveaways!!! Would love to win this cartridge thanks to you and PC. I really need this cartridge. Can't wait to win it. This card is so pretty. Thank you for sharing with us. I have been a follower of yours for a while. Thanks for the chance to win the cartridge. I am already a follower, but wanted you to know how much I appreciate your creativity and your willingness to share with us. I love the card...will definitely have to find this cartridge. This a is a must have...would makes of soldier cards with this if I won! Cute card and oh how I love polka dots!!!!! No need to comment to be in the drawing, WOW. Wanted to let you know that I thought the card you made was adorable. Love the card and the paper. super cute and very essential for card making! this looks like an awesome cartridge!!! !would love it!!! Cute card! Thanks for sharing and thanks for the chance to win! Love the card!! The new cart looks great, too!! Love your card, Joy! You put your own touches on it to really make it shine. I would love to have this new cartridge, as card-making is my hobby, and this one looks like a lot of fun. Thank you for all of your inspiration over the years. BethAnn M.
WOW! Thanks for the chance to win this great cartridge! I have been an email subscriber for some time now and love seeing your new project designs! This looks like a must have cartridge. Thank you so much for letting us know how great it is. Plus I would love to win! I knew the minute I saw a preview of this cartridge it was must have. Your card is so bright and cheerful. Love the scallops. Thanks for showing a wonderful creation using it. Thank you for the give away and sharing your beautiful card! Awesome! Really. I think this card looks really classy and I love the colors. I saw this new cartridge and thought it had great potential! The cards on this cartridge look so pretty!! I make my own cards, like you do, but this cartridge would be great for last minute, short on time cards. Thanks for the giveaway!!! Cute card. I love this cartridge -- definitely on my list of must-haves. Thanks for a chance to win it too. I've been subscribed for a while. pretty card. love the colors. very spring-like. Love the card. Such a cute idea. I don't mind the avocado background. I like the retro colors. Thanks for having all these neat giveaways. I just love to see your new projects. Thanks for doing this. Would love to have this cart. Thanks for the opportunity to win it! I really am in love with this new cartridge, I'd sure love to win it. It was love a first sight for me and this cartridge. I also need it so badly. It covers almost any card I might need in a hurry. I love this card, thanks for all the nice ideas. This is one of the best looking cartridges in a while. Would LOVE to get my hands on one! This cartridge looks super. Love all the styles of the cards. Love to win it! Fantastic cards! I get your emails! Love your cute card! What a great cartridge! I would sure love to add it to my collection! Thanks for the chance to win! Love all the different card designs. How freaking exciting is this!! Love your card & would love to win this cartridge. Thanks so much for the chance! I would love to win this card making cartridge. It would help save time in my card making. Oh, I just love those cards. Thanks for the chance to win this cartridge--I LOVE making cards!! Love the card. What a great cartridge. Oh my, they have really answered a cardmaker's dream cartridge ! Everything you need in one cartridge. Have to say I am totally pumped with this one. This is a gotta have, please ! Thanks for offering this giveway ! I absolutely love, love the cards on this cartridge. So many possibilities. I like what you made as well. Beautiful colors. The cartridge is fabulous! I love making cards! This looks like a fun card. I love the card you made. This looks like a great cartridge! I haven't done much with cards yet...but this cartridge looks like it would be fun to learn with. Yes! I want one, too! Thanks for sharing your beautiful card and the chance to win a really cute cartridge. Oh Boy....I would love to have the chance to win this wonderful cartridge! My cards would look very interesting with all the wonderful designs this cart has!!! Thanks for a chance to win this! Your card is beautiful! I love the fun papers and colors you used! I'm not very good at card making so I think this would be a great cartridge for me! OH my, your card is so pretty and I am so ready for Spring. This looks like a fun cartridge and I love your card. The colors are so bright and spring looking. Thanks for the chance to win!! Love the cartridge, just when I think I don't need anymore they come out with another one I love. :) I love to make cards!! Thanks for the chance to win!! Cute card!! Thanks for sharing your ideas and creativity with us!! love love this card. Awesome job. The cartridge is a fun one and I usually typically make mostly cards rather than scrap! Thanks for a fun chance at winning. Thanks for sharing and thanks for the giveaway! the MAKINGnof more Creative Cards..not that the ones you have made aren't that great, I esp like the one you made with all the blus in it. I also think this cartridge nwill help all of us..sure like all the rest I sure would like to win this one. Funny how many comments one gets when the Blogger gets a..or gives away any sort of "candy"
as they call it,..but THIS GIFT is a real NICE ONE TOO. THANKS for going through ALL the Troubles of doing all of this work---!! i am on the fence about this cart. Keep showcasing the cards from it & I'm sure I'll cave & buy it! Pretty card. Guess this cart will be added to my stash! Unless you pick me! Thanks for the opportunity to win. Love this cartridge and love your posts! I am a fanatical card maker & love this cartridge! It will go great with my CTMH stamps! Your card is beautiful. Thanks so much for sharing. Beautiful card--love the colors and the polka dots! Love todays floral card, the colors are so pretty together! Thanks for the chance to win this great cartridge, I'd love to have it!!!! Such a cute card that is, the colors coordinate perfectly. Thanks for a chance to win. Love the card! And the card cart looks awesome! Thank you for your generosity. Great card and the cartridge looks like it would be great to use for all my cards throughout the year. I am already subscribed and follow you. Thanks for the giveaway. Wow! What a great cartridge! So useful...all in one Love the Polka Dots. One of my favorite choices in cardmaking. This Giveaway is the best. I LOVE this card! Thanks for the chance to win it. It was free on Cricut Craft room last week, so I got to play with it. Great cartridge. I agree-love that creative card cartridge! Your card turned out great. love how the flowers looks with 3 layers. I just love that polka dot paper you used on this card! The last part of your post reminds me of something one of the ladies said as a gag on Betty Whites Off the Rocker show last night. I totally NEED this cartridge too!!!! LOVE IT!!! Creative cards cartridge looks great! I will put it on my wish list. Of course, it would be more fun to WIN it. Thanks for the opportunity to do so. Thanks for all the time you put into your blog. Just starting to use my cricut and this is a great idea! I also need thank you cards for my wedding in may. Thanks for all the tips, I'm in love with your website!!! Thanks for the chance, I`ll love to have that cartridge. Love the colors you chose Joy! This cart looks like a must have -aren't them all? LOL!- thanks for the chance to win it. This looks like a simple card to make. The cartridge looks awesome! I just saw the patriotic and really like that one, too. You are an inspiration with all your neat ideas. Thanks. love this card, I am going to need this cartridge! Super cute with the dotty papers!!! Thanks so much for sharing! Love your cheery and pretty card! I think my favorite ( just from the picture) would be the tri-fold window card. Your card is really adorable, happy and bright. Thanks for the chance to win, but I think this one will be going on my "wish list" (lots of cartridges on it already. Wow this looks like a very cool cartridge! Your card is just great, thanks for sharing it. Love your card & the colors used!! Looks like a super cartridge for quick easy cards! This card is adorable! I love all the bright and fun colors you used. Oh I love your card (but I always love your cards)!! =) Thanks for always sharing your projects. Woo Hoo! What a great cartridge....would love winning this one. They are all great! I love the simplicity of this cartridge. What a great give-away! I've had my eye on the Creative Cards cart ever since it came out. So sweet. Beautiful care. Thanks for sharing. So pretty. Looks like a great cartridge! Lovely and very simple, the perfect match for me. This card is freaking adorable. I can't wait to copy it. So cute. I didn't know Cricut had any other card cart other than Wild Card and WC2. Cool! Thanks for showing us what this cart can do. Great looking card. Love the colors. Thanks for the opportunity to win. Absolutely love this card! Thank you for the "kick in the seat" motivation, I'm ready to invest in this cartridge. I love your blog! Thank you! Love the card. I have not bought a cartridge lately, this one is going on my March wish list.